Selling insurance is a tough job. No one wakes up in the morning excited that they have to get a new insurance policy, yet everyone needs it. Marketing such a product that is essential but ultimately undesirable is challenging. 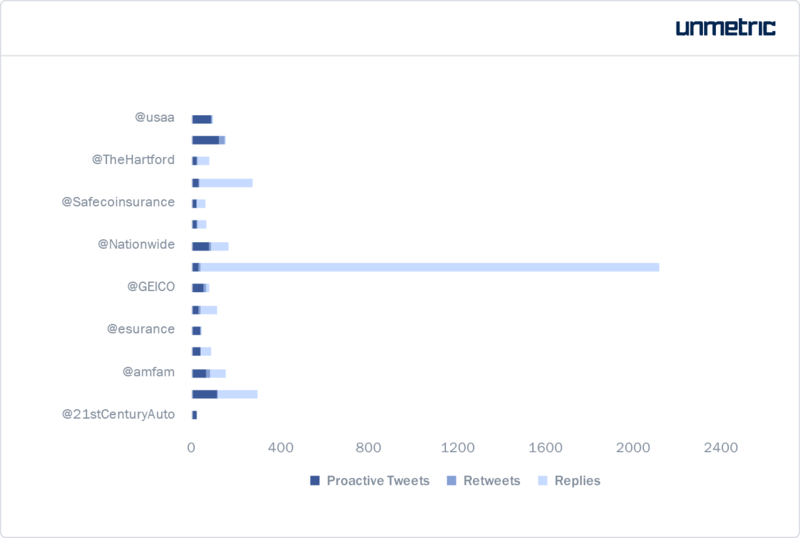 Despite the hurdle, many insurance companies in the US are making strides on social media through engaging content and innovative campaigns to establish themselves as approachable and to drive brand visibility. In this article, we study how some of the North American insurance companies use social media and engage with their audience. The brands analyzed are: Farmers Insurance, State Farm, USAA, Allstate, MetLife, Esurance, GEICO, Progressive, American Family Insurance, Nationwide, COUNTRY Financial, Safeco Insurance, The Hartford, 21st Century Insurance, Travelers Insurance. All the insurance brands studied have a presence on Facebook. 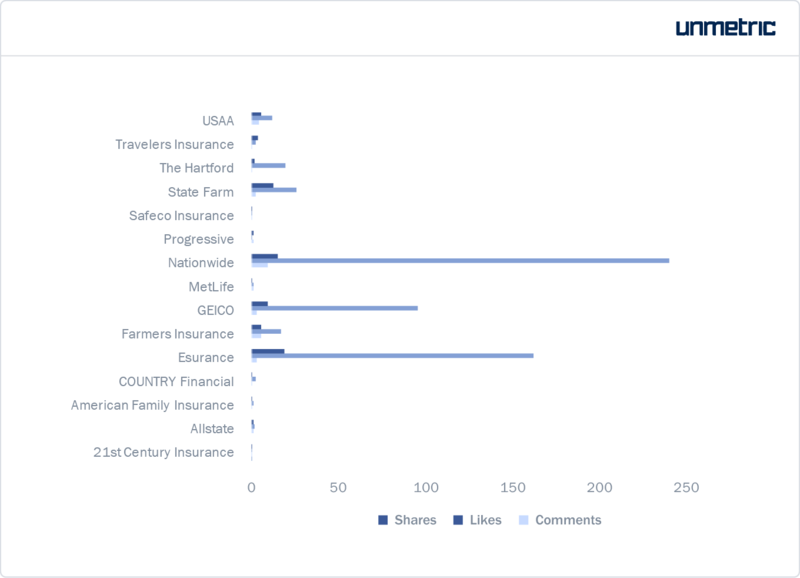 Farmers Insurance and State Farm have the highest audience on Facebook with 2.2M and 2.1M fans respectively. GEICO and State Farm had the highest growth of 4.5% and 6% with State Farm adding an impressive 74.3K followers during the given time period. 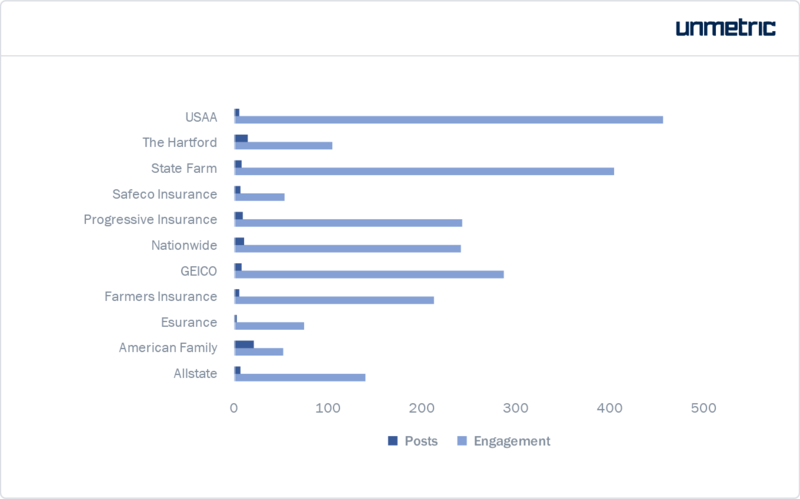 Companies like Nationwide, Esurance, and GEICO had the most engaging posts on Facebook. While Nationwide garnered the most number of likes and fan conversations, Esurance reached a wider audience with the most number of shares. On average, insurance companies posted 38 times on Facebook during the time period. This works out to around 5 posts per week. From the chart above, we can see that there is no effective correlation between posting frequency and engagement. In fact, as Facebook has dialed back the organic reach to almost zero, insurance companies are increasingly promoting their content to gain engagement and reach a wider audience. 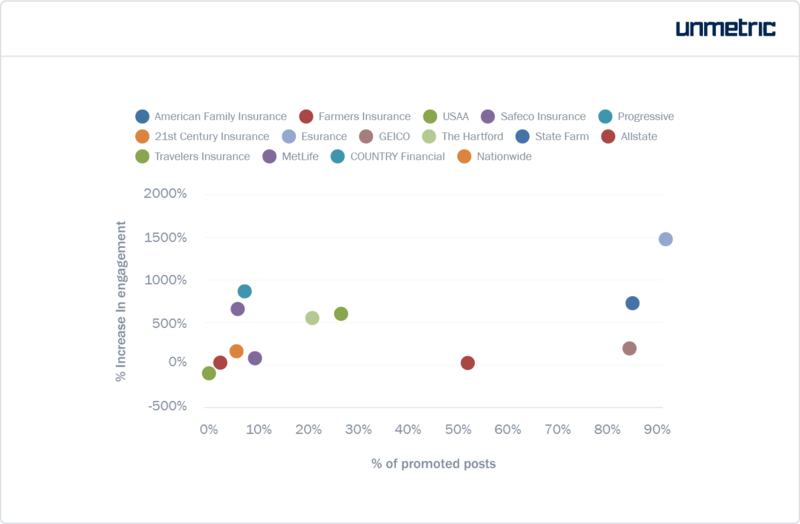 11 of the 15 insurance companies analyzed promoted content on Facebook. Only American Family Insurance, Progressive, 21st Century Insurance and Travelers Insurance relied solely on organic means to spread their message. These companies could have used ‘dark posts’ to advertise, but this data is currently hidden for US brands. Facebook is currently making all ads visible for Canadian users and will look to roll this out worldwide by the time the US mid-term elections arrive. Esurance published the highest number of promoted posts and saw the biggest surge in engagement as a result. Insurance companies can expect between 500% and 1,500% higher engagement when they boost their Facebook content. In order to engage with your audience and generate quality interaction, good content is key. Here are a few strategies that worked for these insurance brands. Nationwide leveraged celebrity endorsers in their social strategy to drive brand awareness. Below is a video of Tori Kelly singing about the insurance brand in the backdrop of a video celebrating human connections. The video ends with the company’s slogan “Nationwide is on your side.” The insurance company is vying to replicate the success of their previous ad campaign with the new jingle version. Esurance regularly piggybacks on events such as holidays, seasons, local festivals, etc. to drive traffic to their Facebook page. Their content is casual, current and definitely not a sales pitch. They create engaging captions that include nuggets of information, presented funnily alongside an eye-catching photo. Can insurance be funny? GEICO seems to have cracked it and manages to consistently gain engagement with their out-of-box thinking. They started an innovative and quirky campaign called #TimeTravelToday that featured humorous imagery, sometimes in the very relatable meme format. Brands like The Hartford and State Farm infused their content with sentiments that resonated with the target audience. The Hartford’s video below humanizes the brand with a heartfelt story that reflects the brand’s personality. By telling stories, these financial brands are softening their image and bringing their product to life by relating it with anecdotes that echo people’s emotions. All 15 insurance companies studied have a presence on Twitter. On average these companies published 4.2 tweets per day – per handle. Esurance has the highest number of followers at 13.1K, followed by USAA with 11.8K. On average, more than 75% of brand tweets were replies. MetLife added 1,965 followers during the time period and was the most retweeted insurance company. They had one of the most responsive customer support teams on Twitter compared to other companies studied, with a response rate of 5.2%. The brand sent 36 tweets per day on average, with 98% of their tweets being replies. Typically, they took more than a day to reply to customer tweets. After MetLife’s February 23rd announcement to cut ties with NRA, the brand earned much higher engagement on Twitter. This single tweet earned more than 20,000 retweets and helped in accelerating brand conversations and mentions. We value all our customers but have decided to end our discount program with the NRA. Of all tweets published by these 15 brands, 77% were replies. Nationwide had the most number of replies and had a higher follower growth of 1.3% than the median in the group. The brand published 169 tweets during the time period i.e. 2 tweets per day on average. 50% of their tweets were replies. It is interesting to note that unlike MetLife which had no ads, Nationwide posted 21 ads on Twitter. The top five ads that received the highest number of likes featured Peyton Manning and Brad Paisley’s ‘The Jingle Session’ commercial. The brand got the highest engagement for the tweet regarding NFL Man of the Year Award, a title sponsored by the insurance brand. On average, insurance companies took more than 20 hours to reply to customer tweets. 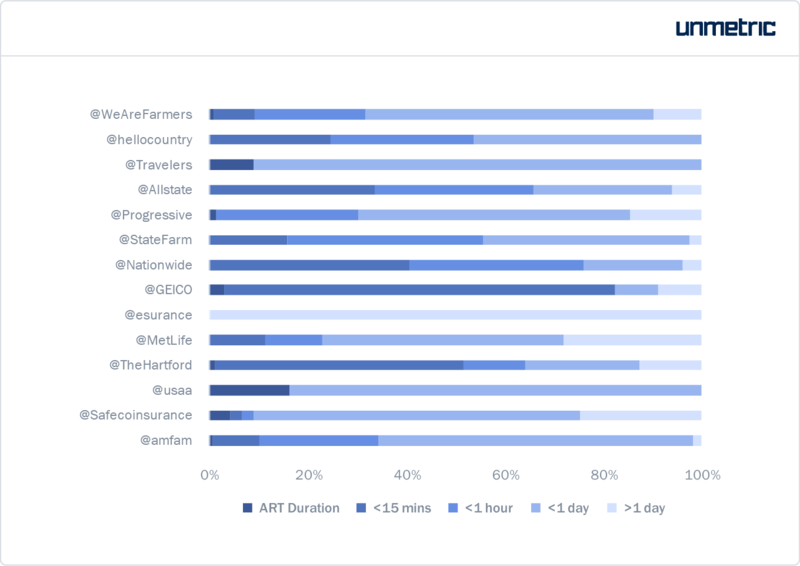 Taking just 1.5 hours on average, COUNTRY Financial replied fastest to customers’ tweets, while Esurance replied the slowest with an average of more than 76 hours. It should be noted that even though Esurance and USAA has the highest following on Twitter, their ART does not indicate their customer service because both the brands have separate Twitter handles for customer care. On the other hand, 21st Century Auto which has the smallest audience size at 902 followers, refrains from using Twitter for customer service. Insurance brands are yet to leverage the full potential of Instagram with only 11 insurance brands having a profile on the platform. USAA has the highest audience at 56.8K, followed by State Farm with 37.4K followers. GEICO showed the highest growth rate and added more than 1.4K followers. USAA and State Farm had the highest engagement on posts, which could be because of their large audience size on Instagram. American Family posted 21 times, the highest number of posts in the group studied, but had the least average engagement. State Farm had the most number of likes. They posted 8 times during the period and received more than 2.4K likes. GEICO had the most number of comments. The brand posted 8 times, all of which were photos. The insurance brand cross-posted its Facebook content on Instagram as well. Only four insurance brands posted video content. Nationwide had the most number of video views. They posted 6 photos and 4 videos. It is pertinent to note that Nationwide’s video campaigns featuring their popular jingle has consistently garnered high engagement on all three social platforms. Watch as singer-songwriter @torikelly gives our iconic jingle a little makeover in our new ad. In conclusion, here are some of the general trends we observed. Facebook is by far the most popular network for insurance brands commanding the biggest audience share with more than 9.6 million fans in total. Photos received the highest engagement on Facebook and Instagram as videos account for only a minor share of content being shared. Twitter follows in audience size with a total of 889K users, with insurance companies using it as an important resource for customer service. While 70% of insurance brands have an Instagram account with a combined audience size of 180K, the photo-sharing platform is not actively used by these brands. Overall, insurance brands have embraced storytelling through different formats and have eschewed self-promotion. Posts that generally receive high engagement involve content that are not product-focused, but instead takes part in a broader conversation that resonates with the audience. Social media isn’t a new medium anymore, it’s a formal part of any marketing mix. Advertisers and content creators have moved away from volume and started focussing on finesse and relevance of content. Insurance as an industry can see measurable results from social media marketing – all you need is a smart strategy and an intelligence solution. Unmetric Analyze will help you access competitor campaigns, detect promoted posts, and leverage all this intelligence to improve your own performance. Request a demo and we’ll show how you can get 7x better engagement.